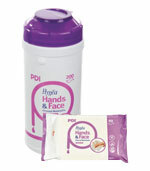 Clinell Patient Wipes are designed for frequent patient use to keep themselves and their immediate area clean. Developed for frequent use, the unique formula with aloe vera is gentle to skin, so patients can use them as often as they want without causing dryness or irritation. Ideal to use before eating, after using the toilet, on the face or hands and on surrounding surfaces such as bed tables, bedside cabinets, handles etc. The clip pack has a mild antibacterial action, and is intended for use on skin and surfaces. Clinell Bed bath Wipes are a simple, rinse free bathing solution designed to clean and moisturise all areas of the body in one easy step. Conveniently replacing the more traditional methods of bed bathing such as; preparing bowls, wash cloths, water, soap, lotions and towel drying; they are also cost effective which reduces laundry bills and nursing time. These large, soft wipes are designed for use on the following areas: face, neck, chest, arms, legs, perineum, back and buttocks. Chlorhexidine Shampoo Caps contain an ingredient called 2% Chlorhexidine Gluconate which not only kills all the harmful bacteria that can usually be found on your hair and skin, but also binds to your scalp and hair for many hours to form an invisible barrier against germs. 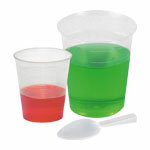 Polypropylene disposable medicine measures for use in all areas of the health care environment that require dispensing and measuring medicines and tablets.